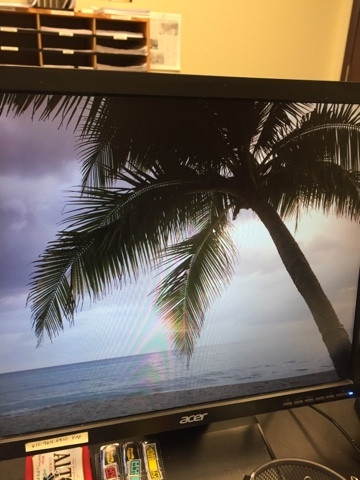 Computer screen yesterday, was wishing to jump through the monitor. lol I love whatever the current theme is on my PC. Most all off the themes are ocean scenes. Of course. 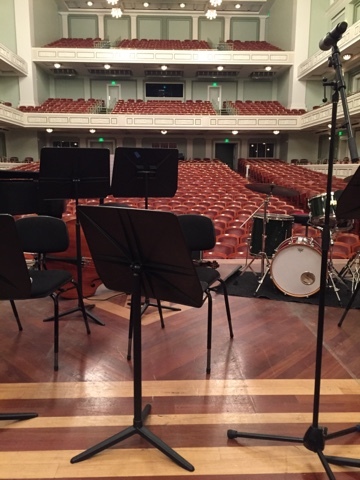 We went to the 6 p.m. on stage event at the Schermerhorn. It was a Jazz Event and I believe it was one of my favorites! You can see how close we were to the musicians. It was a bitterly cold night. I mean bitterly - the kind of cold that it feels like snow could fall at any moment and the wind whipping and fiercely stinging your head unbearably. I was so happy to have my scarf to wrap around my head. I looked like a middle easterner, lol. The event was over about 7:15 and we went to the new restaurant "Diner". The Southern was packed. We can rarely get in there anymore. But we loved the "Diner" and will be back. I think I like it mainly for the view and the food was pretty good too. 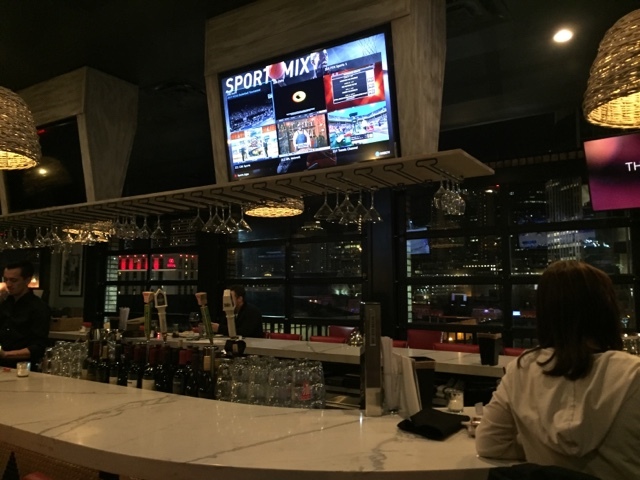 It has several floors with different types of dining on each floor. There is a seafood floor and we will try that one next. We ate on the 4th floor which was the main restaurant. 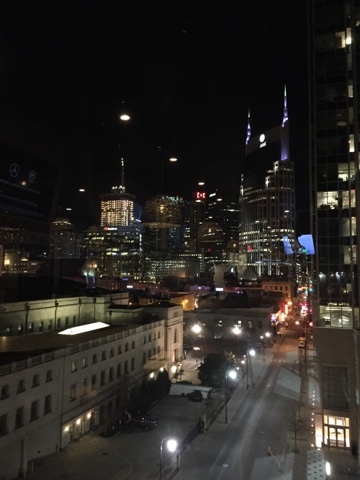 The 6th floor was the bar - overlooking Nashville and just beautiful. Here is the main floor. There was a couple of issues though. 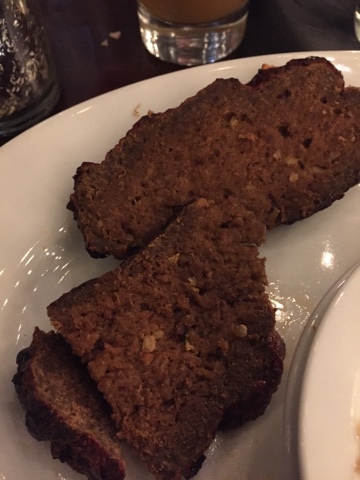 Unfortunately my meatloaf came out dry as toast. I took a pic. It was like leather with no moisture in it at all and no taste. I was quite shocked that they would even begin to serve anything like this. Anyone that knows ANYTHING about food would not serve this. But as George explained "Honey that was not made by a chef, but a cook". We were with our friends, Paul and Judy, and Paul said "no that is going back, we pay way too much to accept that". So I ordered a burger patty instead. And Paul asked for Ketchup for his burger but the ketchup never came. George asked the guy behind us for ketchup as they had some at their table. lol It's like once we reported the meatloaf, our service went downhill and became slow. Everyone was through eating and had to wait for me to eat my burger patty - which came out after a long wait. I put ketchup on it to make it more like meatloaf. At least it was not all dried up. Would I go back? Oh yeah, I just won't order the meatloaf! All of the rest of the food was very good. They had a good broccoli salad. And spinach dip was great. There was just that unfortunate dried up dehydrated meat loaf issue and a little bit of a service issue, but we'll give them a break b/c they are very new. A closer view from the 6th floor. 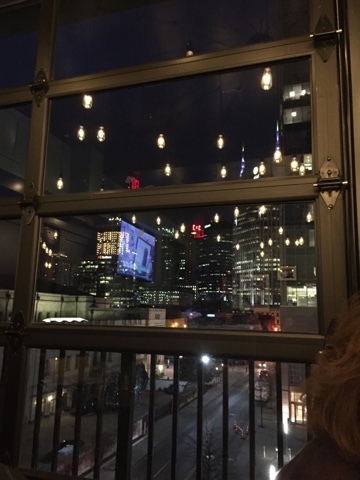 The 6th floor bar, overlooking Nashville. You can't see Nashville very well in the pic but it's there and very cool in person. The full moon was out. 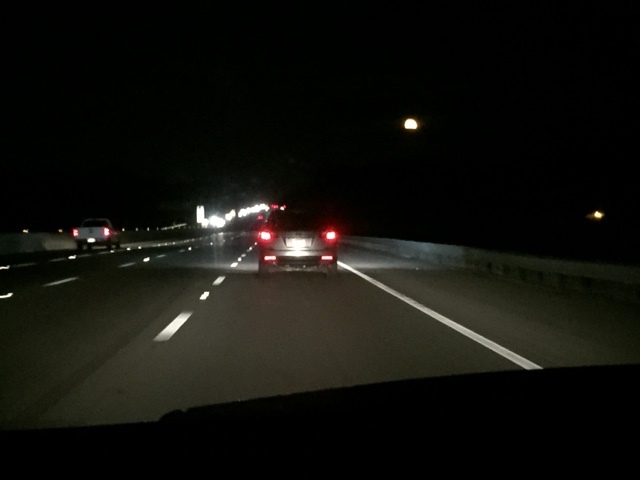 It was a huge moon coming out of Nashville heading home but shrank as the time passed and we got closer to home. The camera pic never quite captures the full experience. Oh well. Got home about 10 and bed felt really good. We've been out for the past two nights and so we are glad to have tonight at home. I'm fixing tacos, but have to stop and get some lettuce. Ours has expired. We've been home very little and I didn't get the lettuce (salad mix) eaten. But I'll stop and get some on the way home. Tomorrow night also is the Shepherd's pie night and I need some things for that as well. Cooking two nights in a row. Not nearly enough to pay back for all the nights George has cooked for me. Anyway, I'm off of here. Ya'll have a great day. 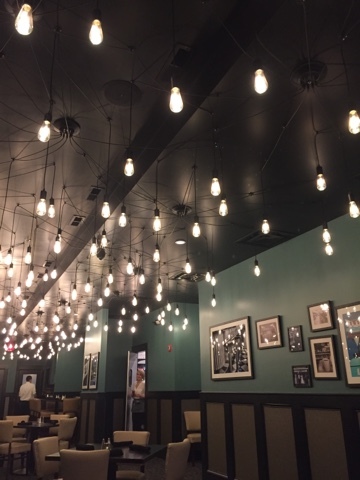 We never go to NEW restaurants until they've been open at least 4 months. Gives them time to sort through all the problems. Sorry to hear about your meatloaf. Even though you had to wait, at least the burger was good. And the views were stellar.